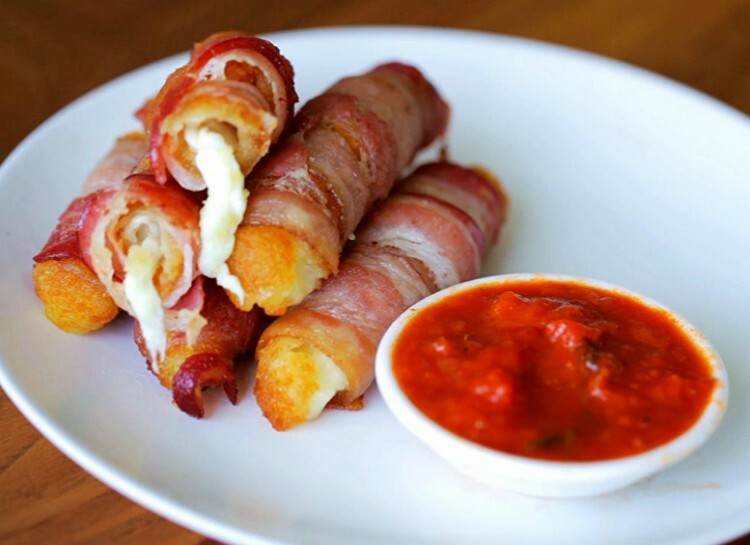 Coffee Time: Bacon Fried Mozzarella Sticks! It looks so tasty as it sounds. So next time you think what to serve for appetizers or to enrich lunch, use this idea. ~ 1 lb. bacon..2 slices per mozzarella stick! ~ Ranch for dipping…or any dippers you’d like! ~ The first thing you need to do is FREEZE the CHEESE. At least for a few hours! ~ Now wrap another slice of bacon around the cheese stick, using it to secure the first bacon slice. Use a toothpick to secure the bacon while frying! ~ Fry them up in hot (350 degree) oil, until they’re crispy and golden, let them cool on some paper towel. ~ Serve them with some ranch for dipping! And DIG IN! ~Enjoy! !